Click below for additional HC Series information. 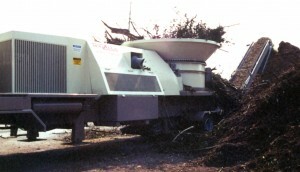 HC series tub grinders have top of the line standard features and innovations. The HC series grinders are manufactured with heavy-duty components for large-scale production while maintaining a low profile and a sleek design. CW offers 3 different models of the HC series grinders including self-loading and self-propelled track drive models. The HogZilla HC series have the ideal combination of features, portability, and large-scale production capabilities to meet all of the needs of large industrial grinding operations. The HC series are high production machines that exceed the capabilities of the largest machine offered by most other manufacturers. The HogZilla HC can be put up against any grinder on the market on price and performance. The HC series is standardly equipped with a Hydraulic Coupling fluid drive. This type of drive eliminates the common repair hassles of a dry clutch and protects the engine from torsional shock. As an improvement over the Hydraulic Fluid Coupling, HC grinders are often equipped with a Torque Converter at the request of the customer to gain the advantages of multiplied torque and load sensing engine RPM Management. Reference the TC Series information for more details regarding the benefits of a true Torque Converter drive.